Boardgames in the News: Are Games a Good Investment? It might seem strange for a courier company to comment on the value of boardgames, however, David Jinks, the Head of Publications at ParcelHero (a UK courier comparison site), has been has been reported to have strong opinions on the subject. He explains how traditional games can be worth many thousands if the edition is right; they even have a page on their website discussing collectible games. So why are ParcelHero so interested? Well, it turns out that buying and selling vintage copies of Monopoly is big business, most of which is done on the internet using sites like eBay (who have several buyers’ guide pages on the subject). Thus, ParcelHero’s involvement is in shipping these items (though in truth it is probably mostly about publicity as there are a lot of other things that they can deliver too). Now, there will always be a market for vintage copies of traditional family games, but what about the more modern classics? Sadly, that early copy of The Settlers of Catan is not worth a lot yet, though of course it might be when the game has been around as long as Monopoly of course. There are modern games that sell for a small fortune however. These tend to be games where there is some combination of high demand, small print-run, popular designer and unlikely reprint. There are a number of games that fall into this category and some are not all that old. Container was released in 2007 by Valley Games Inc., and is an unusual production and shipping game – those who have played it claim there is nothing similar. The recent law suit that ensnared the reprint of Up Front means a reprint is unlikely, so copies cannot be easily be obtained for less than £100. Another example, is Key Market, which was designed by David Brain and released at Essen in 2010, however, only nine hundred copies were made and it sold out very quickly. R&D Games are a small company and have moved on to other things (including one of our favourite games, Keyflower), so it looks unlikely that Key Market will be reprinted in the near future. This is not the only high value game from the Key Series: a set of the earlier titles Keywood, Keydom and Keytown recently went for £1,800! It’s not just games from small companies that become rare and demand high prices. Colosseum was a Days of Wonder game with a wide release, but following an alleged dispute between the designer and publisher, it seems unlikely it will be reprinted. Witch’s Brew is in a similar boat, though it is the implementation of its central mechanism in the Spiel des Jahres winning Broom Service which is likely to prevent a reprint. The irony is that Witch’s Brew and Broom Service are quite different even though though the publisher and designer have been saying otherwise, so demand is not likely to drop, quite the opposite. So clearly there is money to be made from boardgames, or at least, from some boardgames. However, for every game that increases in value there are many that end up nearly worthless. Worse, timing is everything; there is nothing like the announcement of a reprint to have a sudden impact on the market of a desired game. So, before a reprint is announced the price climbs steadily as the desired item becomes increasingly rare and people continue to pay the inflated prices as “they are only going to go up”. When a new release is announced, everyone has to take a gamble. Many potential buyers will wait for the new edition hoping that the price will be lower and the quality will have improved in line with modern expectations. So, demand suddenly drops and sellers are left with a tricky choice: reduce the price and hope someone who hasn’t heard the news will bite, or sit tight and wait. Notably, the recent Fantasy Flight Games announcement of a third edition of Fury of Dracula has led to a sudden flood of copies on the secondary market caused by people hoping to get a sale before the price drops. Similarly, the secondary market price for Mission: Red Planet plummeted when a second edition was announced. On the other hand, waiting can turn out to be a better option in the event that the new edition is deemed inferior to the original. This is not as uncommon as one might imagine, as artwork often changes and there are frequently also “improvements” to the rules as well and changes to some components. Sometimes changes are for the better, but it is not uncommon for buyers to prefer the original. 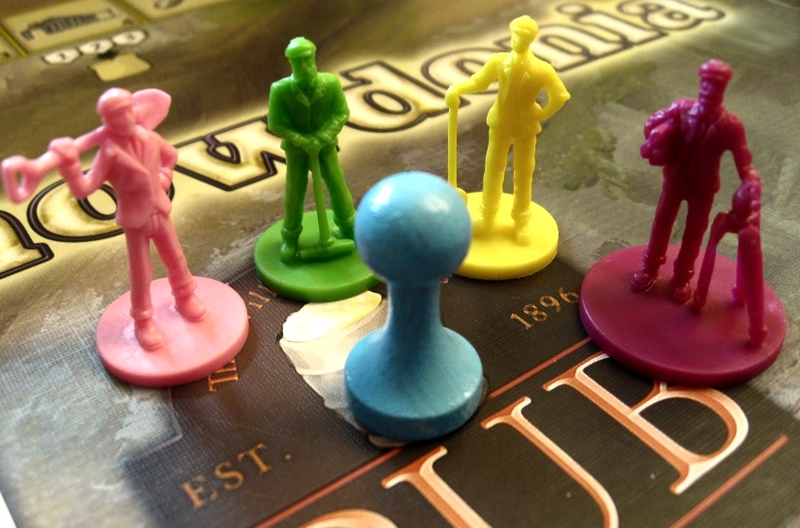 For example, for the second edition of one of our favourite games, Snowdonia, the wooden workers were upgraded to plastic figurines, however, our group find the first edition tokens more tactile. Sometimes, the publicity surrounding a release of a second edition has the additional effect of reviving a market that had become stagnant due to the lack of availability. In such cases, the reprint can actually increase the price of an already expensive edition when the new version is thought of as inferior. Mostly, however, a reprint will cause the price to fall as the difference between editions is something only a connoisseur will really appreciate. So, where does this leave us? There are a number of facts that are undoubtedly true. Firstly, with the exception of the most popular games, almost all modern boardgames are perpetually “between print runs”, with sufficient stock available to supply demand. For this reason, games can suddenly become unavailable and to some degree the buyer should take the opportunity when they see it, as it may not be there for long. That said, the best games generally remain in demand and are almost always re-released in some form or another. The recent announcement by Rio Grande demonstrates that even long out of print classics like the 1992 game Elfenroads, do sometimes eventually get a re-print, albeit in a very different form. The fact that boardgames are currently a niche market means that mature games are inevitably more likely to go out of print with a corresponding increase in demand. So, good games ideally with high production values will rarely depreciate by more than 50% if bought for a good price and sold in the right place. Thus, a gamer with a mature high quality collection who looks their games well, will rarely lose a lot of money if they keep them for long enough, especially if they can chose their time to sell. Of course, spotting good games at the right price is the challenge, but very occasionally, if they have the correct edition, a gamer might make a killing. This entry was posted in News and tagged Broom Service, Colosseum, Container, Elfenroads, Fury of Dracula, Key Market, Keydom, Keyflower, Keytown, Keywood, Mission: Red Planet, Monopoly, Snowdonia, The Settlers of Catan, Witch's Brew on July 30, 2015 by nannyGOAT.